Spartan Kids are back in 2019 and better than ever before! Our Spartan Kids Mission: to encourage kids to jump, run, get muddy, help each other, and have a good time while conquering obstacles. You’re never too young to set goals and celebrate accomplishing them! Our Spartan Kids courses have lots of obstacles for youngsters to challenge themselves on – they’ll climb, crawl under, and even throw a spear as they head around the course. It’s the perfect family day out and every racer is rewarded with a finishers t-shirt and medal! Kids can take part from ages 4-14. We split up our kids into different age groups but we always accommodate friends and siblings so everyone can race together. Parents and guardians aren’t required to run around the course with their children but you’re more than welcome to if your child wants some support…we hope you can keep up with them! Every course is unique and designed to make the most of local trails and forest but you can guarantee there will be a wide variety of obstacles. We love to feature miniature versions of adult obstacles like Spear Throw, Hercules Hoist and A-Frame – all good fun and a good challenge! Every Spartan Kid will receive a Finishers T-shirt and Medal. 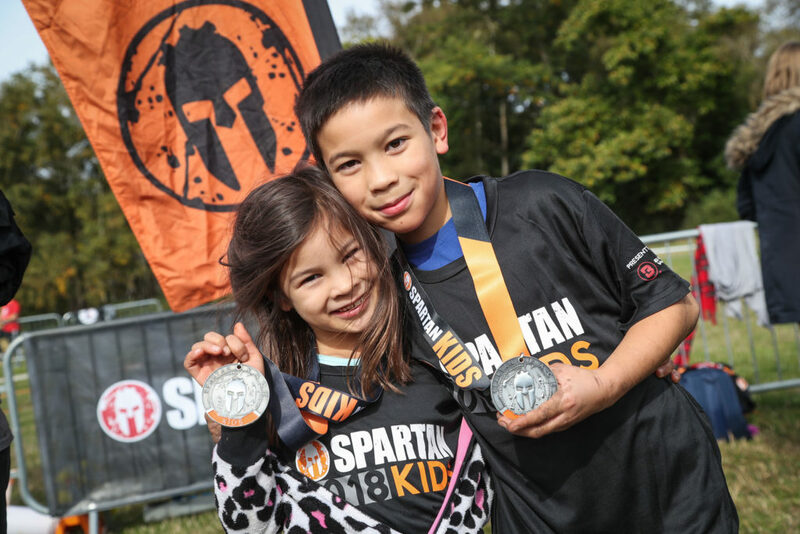 Spartan Kids can earn their Kids Trifecta medal by completing three races in one calendar year. If your kids are aged 10-13 and love a bit of competition then they can race in our competitive wave. Those in our competitive wave have the chance to win a place on our podium and the top three will earn a special medal! Spectators can view select obstacles on the Kids and Adult courses and also have full access to the Festival area. Ready to take your race to the next level? Now we are offering the opportunity for a timed, competitive wave complete with prizes. One wave at each race venue will be dedicated to those looking to challenge themselves further and find out where they place amongst other Spartan Kids. Please note that the Kids Competitive Heat will ONLY take place on the Sunday of each race weekend and is ONLY available for 10 – 13 year olds.